Healthcare workers in KwaZulu-Natal have up to three times greater chance of developing drug-resistant (DR) TB than the general population and face double the average risk of their professional colleagues elsewhere in the country - whether they work exclusively with TB patients or not. According to a study of three KwaZulu-Natal district hospitals (with specialised multidrug-resistant (MDR) TB wards) presented at the third South African TB conference in Durban in mid-June, 8% of healthcare workers were diagnosed with any form of TB and just over 1% with MDRTB.1 Study author, Dr Carrie Tudor of the Centre for Global Health and a doctoral candidate at the Johns Hopkins University School of Nursing, found poorly implemented occupational health (OH) policies, inadequate OH training, little collaboration (and considerable overlap) of OH and infection control/TB prevention activities, plus low acceptance of healthcare testing among healthcare workers (26%). She said immunocompromised staff were not guaranteed re-assignment to lower risk areas and that this was aggravated by a general staff unwillingness to disclose HIV status to management (the 12.47 % identified as HIV-positive were all reassigned to lower risk areas). In the three hospitals surveyed in the Umkhanyakude, Uthungulu and Ugu health districts (bordering the coast from Mozambique in the north to the Eastern Cape in the south), just 18.6% of staff (313 people) were screened for TB, resulting in 23 positive TB diagnoses. Her findings come in a province that has the highest prevalence of DR TB countrywide, accounting for 38% (2 799) of the 7 350 national MDRTB case burden and half of the 536 recorded extremely drug-resistant (XDR) TB cases. KwaZulu-Natal's MDRTB incidence rate per 100 000 population is among the highest worldwide, increasing 10-fold between 2001 and 2007 with XDRTB increasing 45-fold over the same period, in large part due to tripled sampling.2 Tudor told conference delegates that with a 2010-recorded TB case incidence of 1 100 per 100 000 population versus the national incidence of 981 per 100 000, her findings were 'very worrying and should be considered with the highest attention'. The five-fold increase in healthcare worker risk of developing DR TB emerged during her study of occupational health medical records from January 2006 to December 2010. Healthcare workers in TB wards were not at a greater risk of TB compared with those not working in TB wards - the risk was spread across all wards, including the paediatric ward. Professor Anton Stoltz, of the Steve Biko Academic Hospital and Head of the Division of Infectious Diseases and Infection Control and Prevention Unit at the University of Pretoria, told delegates that infection control in healthcare facilities 'had to begin' at managerial or administrative level and include environmental controls before moving to personal protective equipment. A study that his unit conducted in 43 primary healthcare clinics around Pretoria reflected either a misguided use of protective equipment by healthcare workers or facilities which were not properly ventilated.3 'An open window is not good enough. What we need to know is what is in front of the window,' he said, explaining that several open clinic windows were found to be obstructed by cabinets. Stoltz called for a standardisation of tools; 'it's high time we come together and use one tool. Another thing; we must stop wasting NGOs' money on assessments. 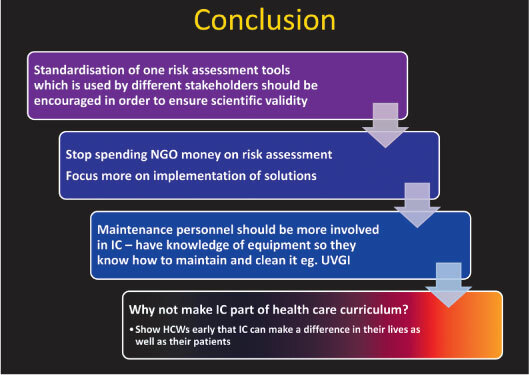 Everyone is doing these assessments but no one is doing something about it (infection control),' he stressed.